Welcome to your art class' webpage. Here you will find important information about you class, what's going on in your class, and what you should be doing. This site is set up to help you with any work you are doing or need to be doing for your art class and with any problems you are encountering or questions you are having that I could not address in class. This site is meant to be used as a resource and a tool. It should not stand alone to help you understand what is occurring in class, but work together with what you are learning in class. Here you will find what activities you class will do on a certain day of the week. Be sure to follow the section for your class! When the activity for the day is finished, if time permits (which is most days) there will be studio time. The following is a breakdown of the which categories assignment grades will be posted in. 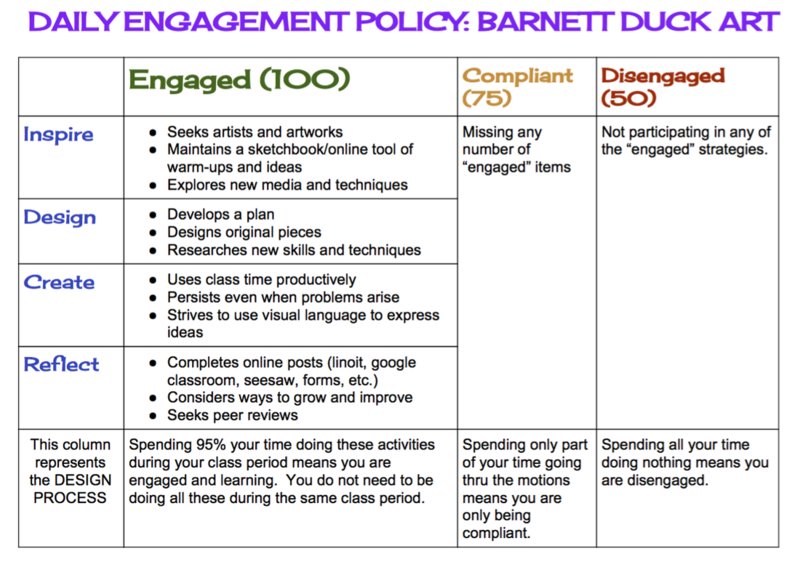 THE ENGAGEMENT GRADE: This is a daily grade based on your engagement in what you are doing. This is not a participation grade as you can be participating, but not really learning anything. If you are engaged in your artwork, no matter the stage of your process, you are learning. The following chart shows what engagement looks like. You will receive a daily engagement grade during studio time. Your weekly grade will be determined by an average of your daily grade.